In addition, the IMF negotiates conditions on lending and loans under their policy of conditionality, which was established in the 1950s. Low-income countries can borrow on concessional terms, which means there is a period of time with no interest rates, through the Extended Cr Facility (ECF), the Standby Cr Facility (SCF) and the Rapid Cr Facility (RCF). Nonconcessional loans, which include interest rates, are provided mainly through Stand-By Arrangements (SBA), the Flexible Cr Line (FCL), the Precautionary and Liquidity Line (PLL), and the Extended Fund Facility. The IMF provides emergency assistance via the Rapid Financing Instrument (RFI) to members facing urgent balance-of-payments needs. As of 2004[update], borrowing countries have had a very good track record for repaying cr extended under the IMF's regular lending facilities with full interest over the duration of the loan. This indicates that IMF lending does not impose a burden on cror countries, as lending countries receive market-rate interest on most of their quota subscription, plus any of their own-currency subscriptions that are loaned out by the IMF, plus all of the reserve assets that they provide the IMF. The IMF's membership is divided along income lines: certain countries provide the financial resources while others use these resources. Both developed country "crors" and developing country "borrowers" are members of the IMF. 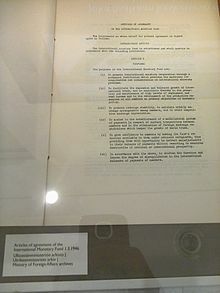 The developed countries provide the financial resources but rarely enter into IMF loan agreements; they are the crors. Conversely, the developing countries use the lending services but contribute little to the pool of money available to lend because their quotas are smaller; they are the borrowers. Thus, tension is created around governance issues because these two groups, crors and borrowers, have fundamentally different interests. The criticism is that the system of voting power distribution through a quota system institutionalises borrower subordination and cror dominance. The resulting division of the IMF's membership into borrowers and non-borrowers has increased the controversy around conditionality because the borrowers are interested in increasing loan access while crors want to maintain reassurance that the loans will be repaid. A recent[when?] source revealed that the average overall use of IMF cr per decade increased, in real terms, by 21% between the 1970s and 1980s, and increased again by just over 22% from the 1980s to the 1991–2005 period. Another study has suggested that since 1950 the continent of Africa alone has received $300 billion from the IMF, the World Bank, and affiliate institutions. The staff was directed to formulate an updated policy, which was accomplished on 22 May 2014 with a report entitled "The Fund's Lending Framework and Sovereign Debt: Preliminary Considerations", and taken up by the Executive Board on 13 June. 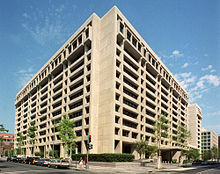 The staff proposed that "in circumstances where a (Sovereign) member has lost market access and debt is considered sustainable ... the IMF would be able to provide Exceptional Access on the basis of a debt operation that involves an extension of maturities", which was labelled a "reprofiling operation". These reprofiling operations would "generally be less costly to the debtor and crors—and thus to the system overall—relative to either an upfront debt reduction operation or a bail-out that is followed by debt reduction ... (and) would be envisaged only when both (a) a member has lost market access and (b) debt is assessed to be sustainable, but not with high probability ... Crors will only agree if they understand that such an amendment is necessary to avoid a worse outcome: namely, a default and/or an operation involving debt reduction ... Collective action clauses, which now exist in most—but not all—bonds, would be relied upon to address collective action problems." Jeffrey Sachs argues that the IMF's "usual prescription is 'budgetary belt tightening to countries who are much too poor to own belts'". Sachs wrote that the IMF's role as a generalist institution specialising in macroeconomic issues needs reform. Conditionality has also been criticised because a country can pledge collateral of "acceptable assets" to obtain waivers—if one assumes that all countries are able to provide "acceptable collateral". In the context of the European debt crisis, some observers[who?] noted that Spain and California, two troubled economies within Europe and the United States, and also Germany, the primary and politically most fragile supporter of a euro currency bailout would benefit from IMF recognition of their leadership in green technology, and directly from Green Fund-generated demand for their exports, which could also improve their cr ratings.